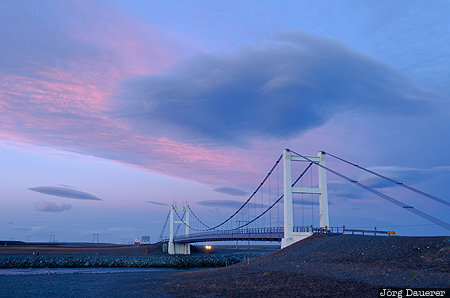 Colorful sunset clouds above the road bridge crossing the outlet of Jökulsárlón glacial lake into the sea. The Jökulsárlón glacial lake is in Austurland in the south of Iceland. This photo was taken in the evening of a sunny day in August of 2013. This photo is part of the exhibition Bridges (February 2019). This photo was taken with a digital camera.